MIDWAY to the 2015 deadline of the Millennium Development Goals (MDGs), the Arroyo government reported last week that the country is well on its way to achieving its commitments, highlighted by a drastic reduction in the proportion of Filipino families living in extreme poverty. 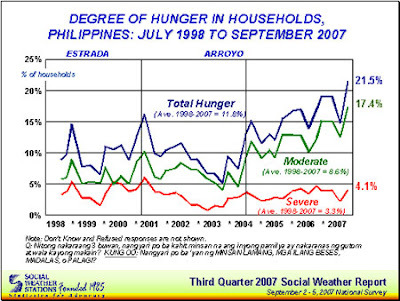 Yet a week prior to the government declaration, the results of the latest Social Weather Stations (SWS) survey seemed to negate this rosy picture as a new national hunger record of 21.5 percent of Filipino households — or about 3.8 million families — was found to have experienced involuntary hunger at least once in the last three months. The new record, up from 19 percent tallied in February and November 2006, is almost ten points above the 11.8 percent average in 38 quarterly SWS surveys from mid-1998 to the present. Hunger declined briefly to 14.7 percent last June. A survey conducted last year by the Bureau of Agricultural Statistics (BAS), according to SWS President Mahar Mahangas, already revealed a national hunger rate of 19 percent. With even more Filipinos now going hungry, Global Call to Action against Poverty (GCAP)-Philippines says the government’s six-month campaign against hunger has proved worthless. Declaring a war against hunger, President Gloria Macapagal-Arroyo announced the release of P1 billion in March to fund school feeding and food for work programs, barangay food terminals, and Tindahan Natin and Gulay ng Masa projects to address hunger in the depressed areas of Metro Manila and several provinces. The hunger response ended last September. Despite this, hunger has remained on the rise. Eradicating extreme hunger and poverty is one of the eight MDGs. Extreme poverty refers to the proportion of families living below the subsistence or food threshold. The Philippines is said to be on track in meeting its target of halving the proportion of people below the food threshold. As of 2003, the proportion of people with incomes below the subsistence threshold was 13.5 percent (10.2 percent of all Filipino families), down from 24.3 percent (20.4 percent of families) in 1991. However, the government uses the subsistence threshold in measuring extreme poverty, instead of the $1 per day international benchmark. The present subsistence threshold is pegged at P40.73 per person per day, with P27.36 allotted to food. This means that one would only need P9 per meal. For these “ridiculously low” figures, several civil-society groups have thus tended to believe that poverty incidence is widely underestimated. Official poverty statistics are also suspect, pointed out GCAP’s Ma. Victoria Raquiza. “To begin with, the comparability of the official poverty estimates of the National Statistical Coordination Board from 1990 to 2003 is undermined by the 1992 and 2003 major methodology changes,” Raquiza said. Comparisons with earlier data sets of the Family Income and Expenditure Survey (FIES) have been deterred by the methodology change in 2003 whose implementation was applied retroactively only up to 1997 figures. Worsening hunger has been caused by a decrease of purchasing power and rising unemployment and inflation, according to a PCIJ report. Food takes up 60 to 70 percent of a person’s income, thus unemployment and underemployment would greatly affect one’s ability to buy food. In 2004, the 5.8 percent food inflation rate was higher than the 5.5 percent overall inflation rate. It was also the highest from 2000-2004. “With the double whammy of higher unemployment and underemployment, as well as higher inflation, hunger will inevitably increase,” said Agriwatch Chairperson Ernesto Ordoñez.